There are several notable things here and the first is that ‘stemness’ is usually defined in two ways: asymmetric division and immortality. The immortality is conferred by telomerase activity which actively lengthens the telomeres that must shorten with each cell division. But the asymmetric division is beautifully illustrated in the image of the creation of the polar body. The tiny polar body gets a very small allotment of cytoplasm and probably is short-shrifted in every other way possible. 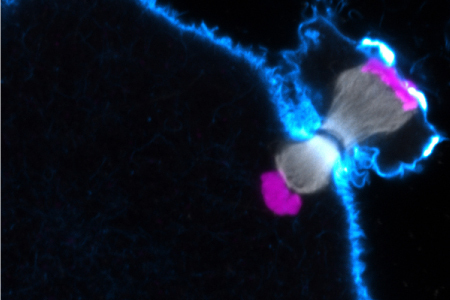 See this blog posting about the recent discovery of asymmetric allotment of organelle quality (mitochondria) in stem cell division. 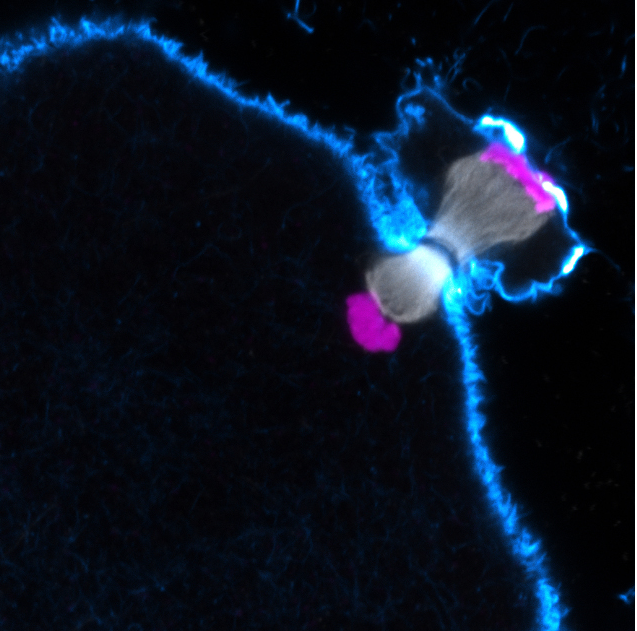 Another great thing about this photo is that it shows the pink chromosomes and how they are separated by the grey kinetochore. 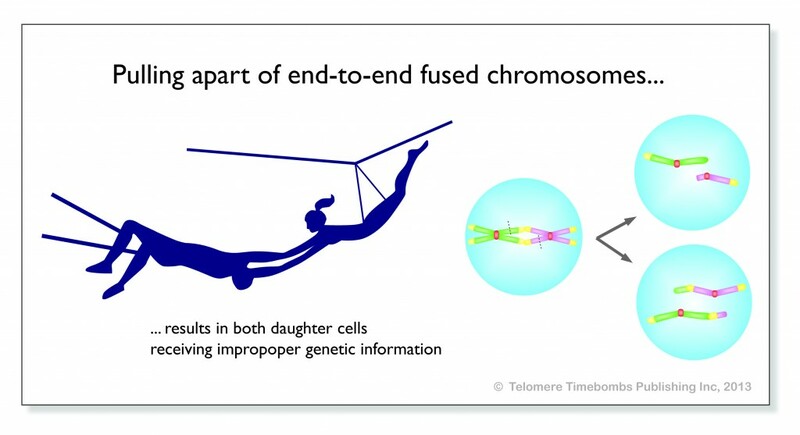 It is this ripping apart by the centers and ends (centromeres and telomeres) that must occur to divide the chromosomes evenly between two daughters. 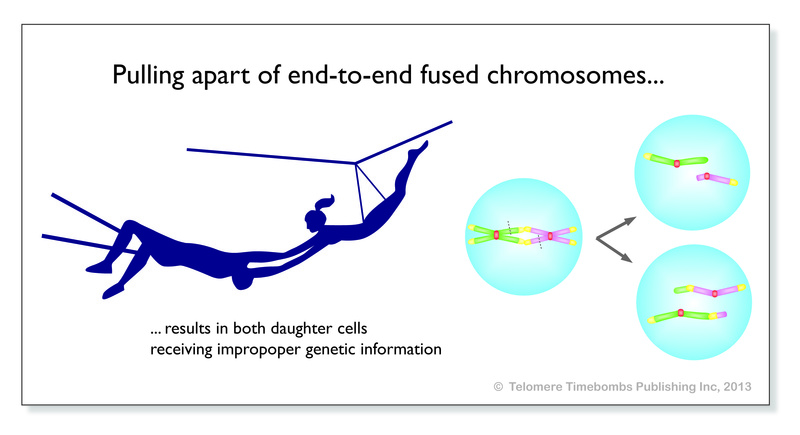 After telomeres shorten, you get fused ends from the repair mechanisms of the nucleus which results in double chromosomes like these trapeze artists glued at the hands. When the chromosomes are ripped apart by the grey kinetochore, there can no longer be an even and correct distribution of genetic material. After this process has begun, the only happy ending of cells in crisis can be self-destruction or apoptosis as I blog about here. Stuart Hameroff, a leading thinker on quantum consciousness, believes that the fundamental unit of consciousness is the tubulin molecule that forms the kinetochore and so many other structures that determine cellular form and function. He states somewhat convincingly that there is no simple chemical reaction that can explain how these tubulin molecules “know” how and when to assemble and disassemble and what their mission is, so they must be acting in some universal, cosmic, inscrutable fashion to make up our biological destinies. Watch this video for more information on Hameroff’s theory of quantum biology.